Frankie Stein did not understand immediately how she got here. It's so beautiful here, music plays and there is so much candy! Only a little later, she realized that it was a dream, but it was so sweet! There are so many tasties! There are candy, sweets and chocolates! A paradise for Frankie. It seems that there is also a lot of great clothes that you can choose and dress them up. What would you advise her? Control in this dress up game just as simple as two and two together. Use Mouse to select what you want to try on a girl and see how it looks on her. Played: 45009. Added: 1-03-2015, 08:12. 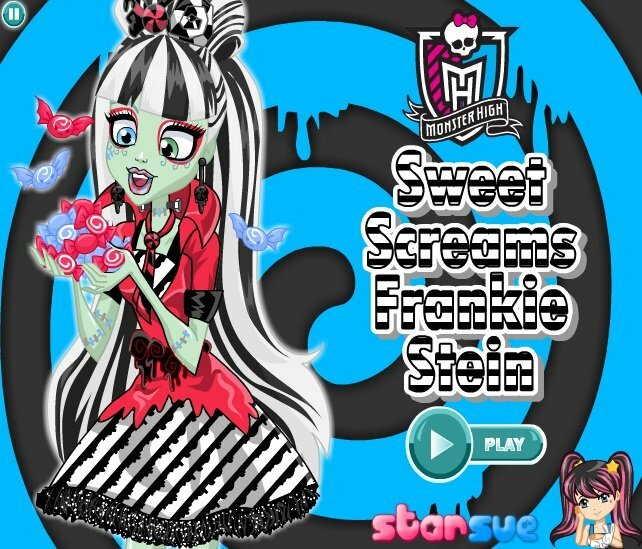 Sweet Frankie Stein dress up game. New dress for Frankie Stein.